Be the first to share your favorite memory, photo or story of Bette. This memorial page is dedicated for family, friends and future generations to celebrate the life of their loved one. 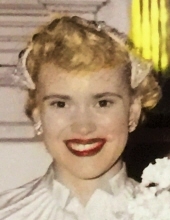 Bette Lee Hogarth Capozello, 85, of Elysburg, PA passed away peacefully on Friday, February 1, 2019 at Watsontown Nursing & Rehab. Center, Watsontown, PA.
Bette led a life filled with zest and accomplishment. As a child in Omaha, Nebraska, Bette excelled in athletics, in particular baton twirling, dance and acrobatics. She went on to become a National Baton Twirling Champion and performed at numerous venues across the country. Along the way she worked with American icons including Johnny Carson who launched a nationwide search for Bette in the 1970s. After tracking her down, Johnny invited Bette to guest star and perform on the Tonight Show where she performed with her virtuoso husband, John Capozello. John and Bette performed together throughout the years as a duo under the stage name: Roberts and Lee. Bette’s love of the creative arts carried into her adult life. She worked as a baton and dance instructor, drama coach and performance artist. John was always at her side to fill her life with musical accompaniment and humor. Bette had a heart for animals and supported community animal rescue projects. She also volunteered with the Red Cross and local organizations. She displayed compassion for all and did her best to bring a smile to all those around her. Bette’s family was her shining treasure. She dearly loved her family and was proud of each and every one. Bette enjoyed holidays and was known to remember birthdays and special occasions. She eagerly waited at the door on holidays for visits from friends and loved ones. Her door was always open and her Elysburg home became a waystation where folks could drop in for a visit and share a soda. Bette Lee was a strong woman who lived life on her own terms. Her roots in the theatrical world had instilled in her a credo by which she lived her life: The show must go on. So even as Bette faced her final curtain, she maintained strength, dignity and grace that inspired others. Bette Lee Hogarth Capozello is now reunited with her beloved parents, husband, son, grandson and others—including her beloved pets who preceded her in death. She leaves behind two daughters, grandchildren and great grandchildren, but mostly she leaves behind a legacy of love indelibly imprinted on the hearts of all who knew her. Funeral services will be held at the convenience of the family. In lieu of flowers, donations can be made to The Humane Society, 301A Boone Rd, Bloomsburg, PA 17815 or to Elysburg Fire and Rescue,1 E Mill St, Elysburg, PA 17824. Rothermel-Heizenroth Funeral & Cremation Service, Elysburg is in charge of the arrangements. Charles Heizenroth III, F.D. Joe Murray, Supervisor. To send flowers or a remembrance gift to the family of Bette Lee Hogarth Capozello, please visit our Tribute Store. "Email Address" would like to share the life celebration of Bette Lee Hogarth Capozello. Click on the "link" to go to share a favorite memory or leave a condolence message for the family.